I’m so excited to be participating in Sunday Supper! I’ve read so many of the awesome recipes that have been contributed over this past year and finally decided I had to join in. I’ve always been a big believer of sharing meals together whenever possible. Food can be so powerful and when shared in the right way can help to bring families as well as friends closer. There’s just something special about sharing a meal together that naturally opens up the lines of communication. I’ll be honest we didn’t always eat at the table when all of our children were home and we didn’t even always eat at the same time. However when we did it was always a treat and we were so happy to have spent the time together as one big boisterous family! Part of our problem was that we never had a table large enough to seat all of us. If you have that problem as well you will want to keep your eye out for an awesome DIY post coming in the next few months. For now even if you all sit in the living room and eat at the same time with the television off you are sharing and making memories. This Low-Carb Slow Cooker Chunky Beefy Vegetable Soup is a perfect recipe for you to host your own Sunday Supper! It’s healthy, has minimal prep and cooks in the slow cooker, allowing you to spend your time doing the things that mean the most. This week Sunday Supper is slowly bringing in the New Year by sharing slow cooker recipes. I have an amazingly easy and delicious Low-Carb Slow Cooker Chunky Beefy Vegetable Soup recipe to share with you that your whole family is going to love! You can check out more delicious recipes by clicking the links below. Put beef in slow cooker first then dump tomatoes with juice over top. Use a spoon to cut the tomatoes up a bit but leave them chunky. 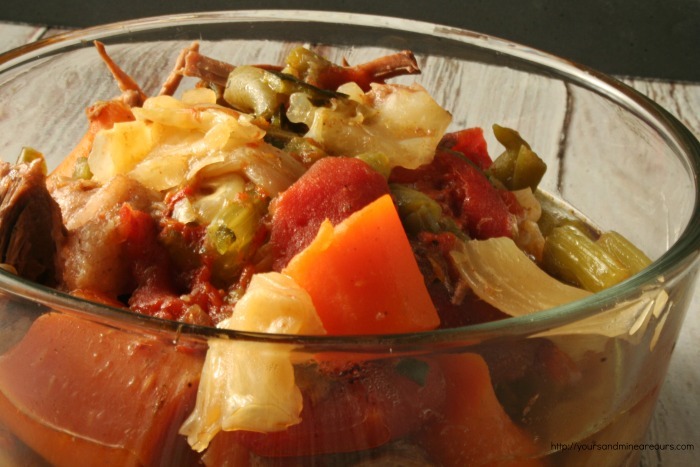 Chop all vegetables into half inch pieces and put in slow cooker. Cook on high for 6 – 8 hours. Shred Beef with a fork, stir and serve. Ease into 2014 with these great slow-cooker and crock pot ideas from the Sunday Supper Group! Thank you, Marjory! I'm really excited to be a part of the group. Can't wait to make my rounds to all of the amazing recipes today. I love using my slow cooker! Thank you, Jennifer! I can't wait to make it over to check out your Chicken and Wild Rice Soup. It sounds yummy. Thank you, Renee! Cabbage is definitely one of my favorites. I can't wait to check out your Pot Roast with Portabello Stew. Yum! Nice to find your blog through #SS. This is my first participation also. And like you, I've been reading great recipes from this forum for a long time. I'm glad I've joined in also. Great looking stew. Thank you, Lea Ann! How fun that we're both new. I look forward to checking out your blog. Thank you, Cindy! The past year or so I've become a huge fan of soups and stews. So glad you've joined us, Tammy! Such a yummy soup...and I love that it's low carb! Thank you, Liz! One of my goals for the New Year is to make healthier choices. Mmmmmm! This sounds so good. You have included some of my favorite veggies. I am glad you're here, welcome! I look forward to getting to know you and sharing meals aroung the #SundaySupper table! HUGS! Thank you for the sweet welcome Cheryl! I can't wait to visit your blog. Thank you, Shaina! I'm happy to be a part of the group. Thank you, for stopping by Courtney. I cannot wait to check out your Beef Brisket French Dip Sandwiches. They look amazing. Thank you for stopping by and leaving such a sweet comment, Constance! Sounds and looks yummy! I love chunks of beef and veggies! Thank you for the kind comments, Kim! Welcome to the Sunday Supper group! Your soup looks incredible, and I love how quick and easy it is. Thank you, Isabel! I'm happy to be a part of the group. It's one of my favorite go to meals. We usually have potatoes in it though but I'm trying to cut back on carbs. Can't wait to make it to check out your #SundaySupper recipe. Thank you, Lori! The zucchini was a first for me. It turned out great! Thank you, Dorothy. I am anxious to try your recipe for Slow Cooker Chickpeas. Welcome, welcome to #SundaySupper!! Your recipe looks so good for these cold days we are having, thanks so much for sharing!!! Thank you, Christy! We have one son who is so picky and it's really a challenge to get him to eat anything so I understand how you feel. I know Rachel, aren't they they best? Thank you for stopping by and for pinning my recipe! Thank you, Wendy! I love recipes that are so simple and quick to put together. Thank you, Winter! I agree that rolls would be delicious with it or some crusty bread. Thank you, Brandi! I hope your family enjoys it. It's always great to have simple go to recipes for those busy days. Thank you, Chandra! It's been well below zero here for the last few days so recipes like this are especially good right now. Thank you, Renee! I look forward to many more #SundaySuppers. 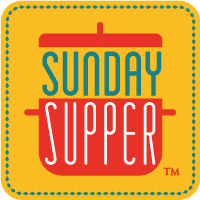 I've never heard of the Sunday Supper, but I love the concept! And what a great meal that you shared . . . it looks hearty and delicious. Thank you, Rachel! Sunday Supper is definitely a wonderful concept and really it can be any day as the principle is to share meals as a family. I hope you love it, Pauchee! Thank you, Heather. I'm so glad you stopped by. Thank you, Cara. I'm trying to incorporate a lot more low-carb and paleo into our daily diet. Oh that's awesome! Another week and you will begin feeling great!